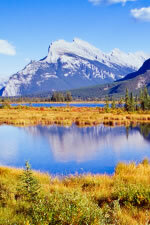 Welcome to the most comprehensive guide to finding a bed & breakfast in Banff, Alberta, Canada. This site is dedicated to helping you find the perfect Banff bed & breakfast and we have listed every bed and breakfast in Banff, along with a detailed map showing the locations of all Banff bed and breakfasts as well as the major tourist attractions in town. In addition, in the right hand column, we have provided links to all the major online resources for researching Banff B&Bs, as well as useful bed and breakfast websites for other destinations in the area. We wish you a pleasant trip to the Canadian Rockies!